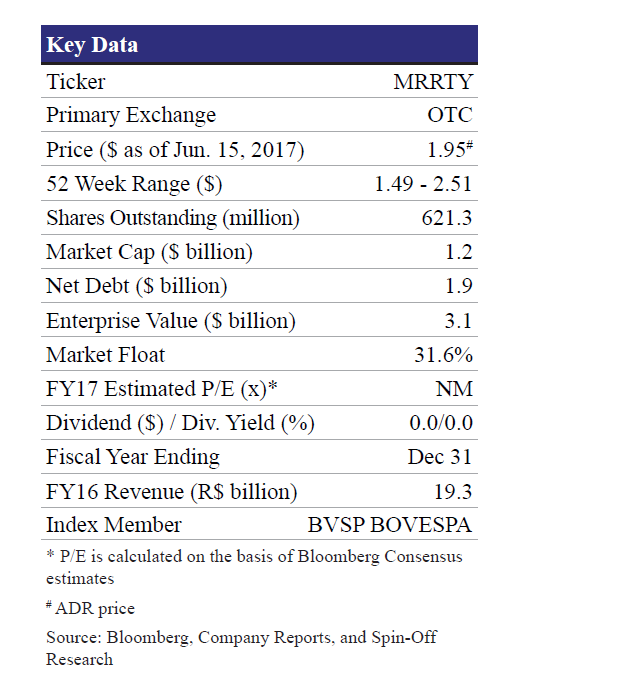 On May 11, 2017, Marfrig Global Foods (OTC US: MRRTY, $1.95, Market Capitalization $1.2 billion), Brazil’s second-largest beef producer, announced its plans to carve out a portion of its holdings in Keystone Foods Holdings LLC in the United States. Keystone is a subsidiary of Marfrig Global that supplies chicken products to major fast food chains, including McDonald’s. The company has already confidentially submitted a draft registration statement (Form F-1) with the U.S. Securities and Exchange Commission (SEC) corresponding to the proposed IPO transaction. However, the timing and the tax nature of the transaction depend on satisfaction of several customary conditions, including SEC’s review process and market conditions, among others. Keystone plans to use the proceeds to finance growth and for general corporate purposes. 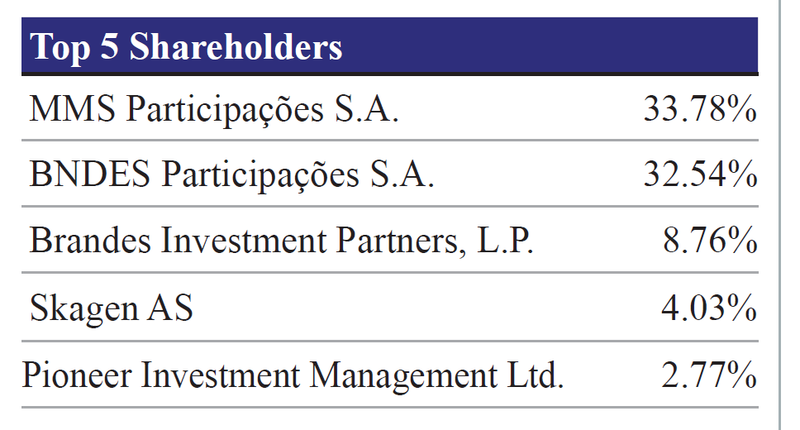 The stock reaction was lukewarm with only 0.9% uptick in the share price to R$7.69 on the date of the announcement. However, the share price reflected the value-unlocking potential of the separation with stock jumping 37% in the month just before the form F-1 filing announcement on 5/11. 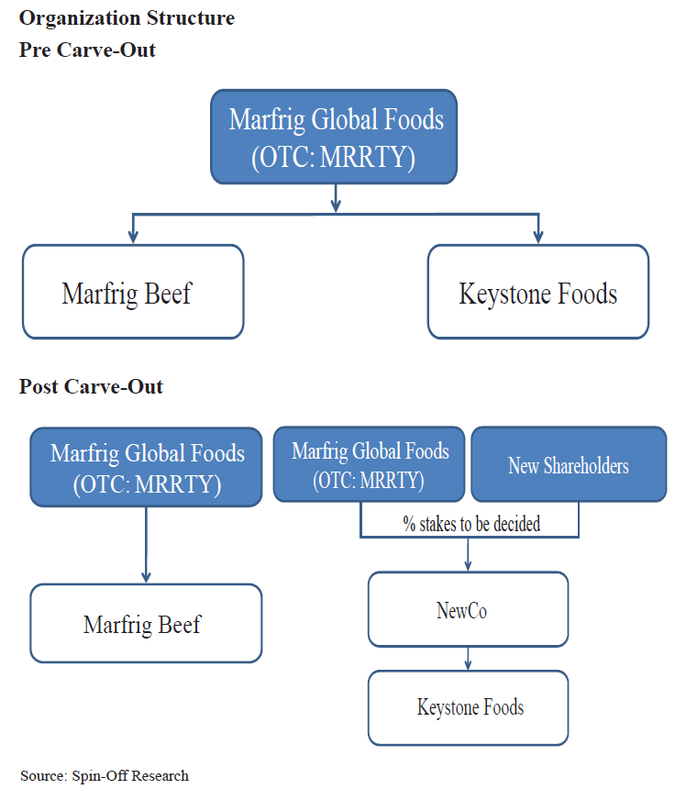 Marfrig’s move to carve-out a portion of its stake in Keystone does not come as a surprise as the company is saddled with debt due to its prior acquisitions (including that of Keystone in 2010) and has been talking about IPO/divestiture for the last three years. The announcement follows the company’s sale of its entire Moy Park business unit (the largest producer of poultry in the United Kingdom) in June 2015 for $1.5 billion. It is worth noting that the market was anticipating the potential Keystone IPO resulting in a one-month share price rally of 37% as of 5/11, the date of announcement. In addition to deleveraging Marfrig, the transaction is expected to unlock significant shareholder value for Marfrig as the separation would lead to multiple expansion for Keystone to converge with its industry peers (~11.0x 2017e EV/EBITDA vs. current multiple of 9.0x). However, it remains to be seen how much does the company offload in this IPO and to what extent the transaction helps the company deleverage. Some of the historical divestitures (Keystone Logistics, Seara, Moy Park) of Marfrig in last 6 years were not productive in deleveraging the balance sheet as the company still has a high debt level with a high net leverage ratio of 4.1x in 1Q17. As a stand-alone company, Keystone is well positioned to capitalize on its continued profitability and volume growth (as against the lackluster performance of Beef segment of Marfrig). The subsidiary recently reported net revenue of $667 million, up 7% YoY, driven by volume growth of 5% in 1Q17, and adjusted EBITDA margin improved 30 bps YoY to 9.4%. But revenue from the beef division was down 18% YoY in 1Q17 and adjusted EBITDA slipped 230 bps to 6.7%. The separation would allow both the companies to focus on their respective niche areas and provide flexibility to capitalize on distinct growth opportunities. Marfrig Global Foods (OTC US: MRRTY), is one of the world’s largest producers of animal protein food products. With production, sales and distribution units located in 12 countries, Marfrig is one of Brazil’s most international and diversified food companies. The company comprises two operating segments: Marfrig Beef and Keystone. Marfrig Beef segment is mainly responsible for the slaughter, manufacture, distribution, import, export and marketing of beef and lamb meat, while the Keystone division produces and develops multi-protein foods to serve global restaurant chains, including McDonald’s, Subway, ConAgra Foods, Campbell’s Soup, KFC, Taco Bell, Wendy’s, Heinz, and Burger King, among others. The company has a strong presence in four continents, namely the Americas, Asia, Europe and Oceania, with 48 commercial production and distribution units across the globe. The company reported revenue of R$19.3 billion ($5.6 billion) in 2016 and has employee base of 29,200. Founded in 1956 and based in West Chester, Pennsylvania, Keystone Foods LLC is a global food services company that supplies animal protein products, including poultry, beef, fish and pork. The company offers ready-to-cook, breaded, and par-fried poultry products, including tenders, fillets, patties, wings, and nuggets; fresh poultry and deli rotisserie that include whole chickens without giblets and cut-up chicken; and protein products. It serves quick-service restaurant, retail, and commercial and consumer product customers. The company has manufacturing facilities across North America, the Asia Pacific, the Middle East, and Africa. The company has more than 11,000 employees and reported net revenue of $2.7 billion in FY16. Cars.com will list its stock on the New York Stock Exchange today in what is expected to be the biggest initial public offering of a local company so far this year. The company, which provides car buyers with research and makes money from selling ads to car dealers and automakers, has grown into one of Chicago's largest digital media businesses, with revenue of $633 million last year and a headcount of nearly 1,300, according to a regulatory filing for the IPO. "We expect the trend of more car shoppers going online in search of cars to continue and as a result, advertising revenue from increased traffic to web sites such as Cars.com should jump," Spin-Off Research said in a report. Still, it caveated its outlook by noting a hefty $650 million Cars must pay its former parent, McLean, Va.-based Tegna, as part its spinoff. The May 19 report from Spin-Off Research estimates a market capitalization of $2.2 billion, based on a $30 per share price. That would make the IPO the biggest for a metro Chicago company since trailer and motorhome company Camping World went public last October. Cars was launched in 1998 by a group of newspapers, including Chicago Tribune's parent, that were eager to hang on to lucrative classified auto advertising. Back then it was a division of the now defunct Chicago-based Classified Ventures. Now, it's an advertising juggernaut. Revenue climbed 6 percent last year, lifting net income 11 percent to $176.4 million. Cars, with a clutch of sites including Auto.com and PickupTrucks.com plus mobile applications, has grown so much that it's moving into a larger building this month, shifting west from the Loop to the other side of the Chicago river near Union Station. Still, the regulatory filing sought to assure new investors that it will "deliver robust results while maintaining a low headcount relative to the size of its operations." To that end, the company cut three dozen employees last month, including some who had been with Cars from its earliest days, according to sources familiar with the job reduction. In a statement, CEO Alex Vetter said this about the reorganization: "Throughout the last several months, we assessed the skills needed to run as a standalone public company, and these changes will ensure our sustainable future as a leading digital automotive marketplace." In the twisting corporate history of Cars, Gannett bought out its other newspaper owners in a 2014 deal that valued the digital company at $2.5 billion. Then Gannett split into two companies in 2015, cleaving its newspaper business from a group of digital businesses, including Cars, that became Tegna. Tegna spun off the Cars unit last month. Cars faces an increasingly competitive industry despite the expected growth of digital advertising, with a fleet of rivals, including Autotrader.com, owned by Cox Enterprises, which has been expanded through acquisitions. Cars made its own purchase last year of a site for car dealer reviews called DealerRater. "This industry will consolidate more over the next few years and I think being a standalone independently held company positions us to be one of the consolidators in the category," Vetter said in an interview, adding that Cars acquisitions could be in any part of the industry. Cars told investors and prospective shareholders last month that revenue growth is likely to be flat this year, with profit weighed down by costs associated with taking the company public and increased marketing expense. Next year, the company said, it expects revenue growth to rebound to 5 to 10 percent. Vetter started as a Cars sales representative in 1998, moving over from Tribune Interactive. The company has signed up Scott Forbes, formerly chairman of Orbitz Worldwide, as its new board chairman.